The file can be installed by doing the update as normal from Special Options. I'll have to keep that configuration in mind if I restore the over-the-air firmware updates, since that combination of hardware and software would have not been recognized by the original system - it would have either never updated, or always indicated the need for one but be unable to do so. I will try it after backing up the original config. Duane, I'm sure that there's nothing to be worried about. This is 1.0.7, with a few files modified (In the bitmap directory, I changed the files that said .insignia at the end of them to .insignia.old, and changed the normal images to say .insignia at the end of them). Besides changing these settings and the opening animation, there is nothing at all changed. It still downloads the I3.5 control panel when it's powered on. Firmware updates are triggered based on the hardware ID and the currently installed firmware version. Well, the version of the firmware is 1.0.7, and the hardware is whatever the crypto processor reports it to be. I didn't change anything relating to hardware IDs, or the control panel download sequence. Right - so the particular combination of that hardware ID and that firmware version is not something that would normally be encountered by the OTA update system - I would need to make sure it knows about it. The Control Panel mechanism is a bit simpler - an unrecognized device combination typically gets the 3.5" Control Panel by default, and there's no harm in that. With firmware, however, it would be a disaster to deliver the wrong one. Well, I'm pretty sure that there's nothing fishy going on. Here's a picture of my About screen if it helps you pinpoint anything strange. 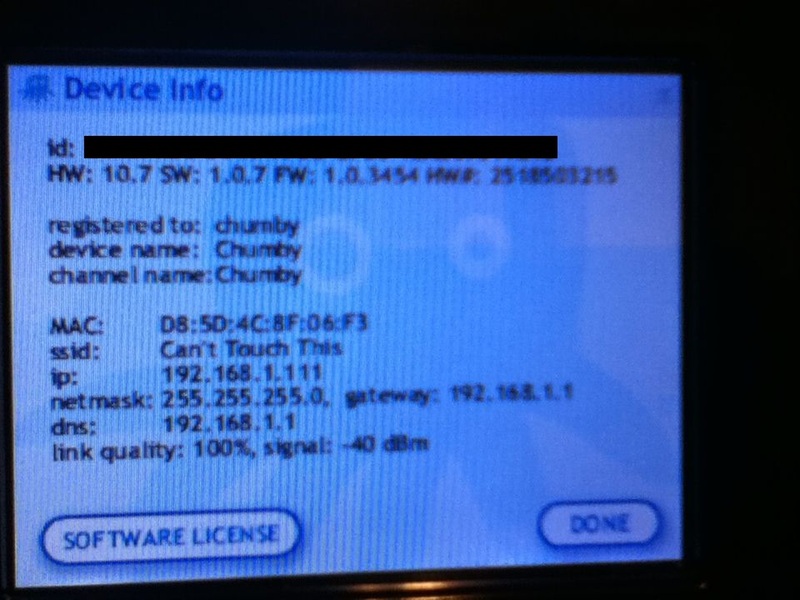 Yes, my WiFi is named "Can't Touch This". It's MAC secured. Hopefully more than just MAC secured. MAC addresses are very easy to spoof. The thing is, it all depends on the location. If it's some kind of white-hat security conference, or I was using mission-critical files, I'd agree. However, if the guy across the street has unsecured WiFi and the guy next door has WEP, I don't think that some wardriver is going to fire up Wireshark and start sniffing packets. Plus, this connection is just an extender and doesn't link to any of my files.